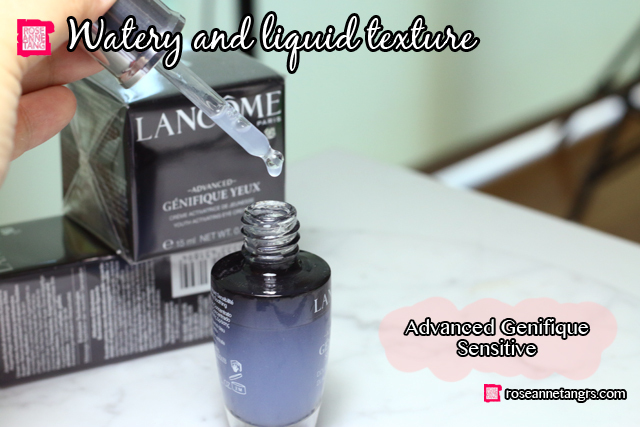 Today I’ll be doing a review of the Lancome Advanced Genifique Sensitive Dual Concentrate serum. 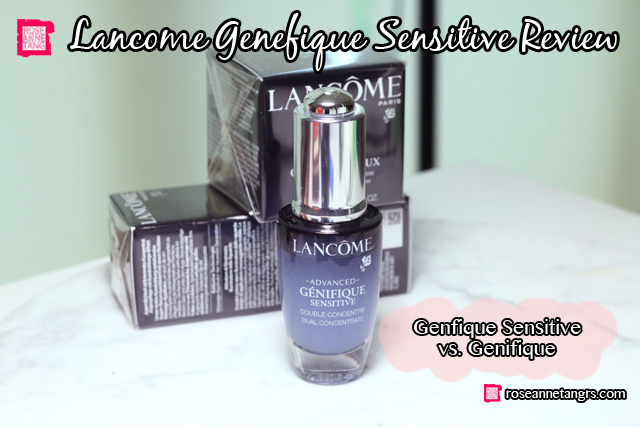 As an avid fan of the Lancome Genefique range, especially the iconic Youth Activating Concentrate, I was pretty stoked when they came out with a serum that would help with sensitive skin. I’ve been using the serum for a few weeks now and for the most of it, I was honestly quite underwhelmed. I think it’s because I’m so used to the Youth Activating Concentrate which is actually really powerful in making your skin glow (even my friend says so). With the Youth Activating Concentrate, I also see my pores become minimized and my skin just becomes overall smoother when I use it day and night. It’s similar to the effects of the SK-II Facial Treatment Essence in my opinion. 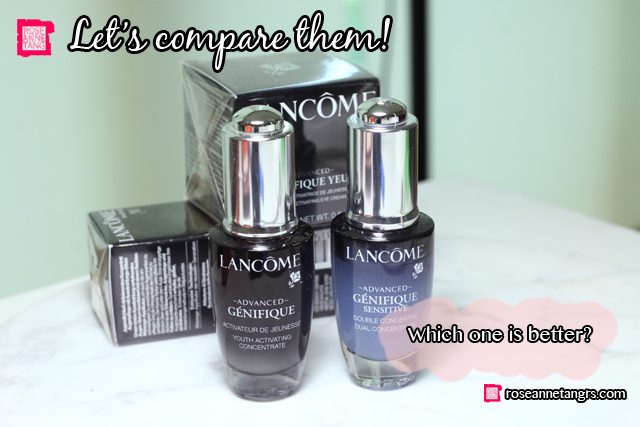 Both the SK-II Facial Treatment Essence and the Lancome Advanced Genefique Youth Activating Concentrate are a powerpacked duo that works really well for me. The product is really watery, and smells a little salty in my opinion. It’s something I wouldn’t pay $120 for, but maybe something I would get off the shelf at say at a random beauty store. The texture is everything for me and this serum just absorbs into the skin and fades away so fast. Even when I twist and turn the bottle you can see the liquid just roll around like nobody’s business. I didn’t see much effect after use. My skin didn’t glow, I still had redness in some areas and it didn’t treat the dryness either, whereas the Youth Activating Concentrate does all this and more pretty much within a 2 week period. I do get dryness and redness all the time, and this didn’t really make it better. The only ray of light came from yesterday when I don’t know why, I had a huge sore bump on my lip. I didn’t know what to put on it, and I thought ok let’s put this serum on it and see what happens. Well, I was really pleasantly surprised. It went down, and it went down quickly! Sometimes I hear that Advanced Genefique breaks some people out because of how power packed it is, so maybe this is a good alternative to try. Overall, I say go for the Youth Activating Concentrate. It really works, trust me. I’m not so sure about the Sensitive to be honest and I’m not a fan of the watery texture. I didn’t see improvements in my skin, only that time when I had a swollen bump on my lip. It says also it’s major selling point is protection from pollution which I find you can’t really see with the naked eye. If you live in a highly polluted environment, I reckon you would need something like this. Have you tried using Youth Activating Complex together with SK-II FTE? Is it okay to mix them together?